Are students weighted down by debt? A student loan is designed to help students pay for their college education in regards to their tuition, books and other living expenses. There are many different types of loans that students can take out. “Because I do have a lot of students who borrow loans, not for educational expenses because they’re not exactly considering the fact that hey, this refund check looks great now, but four years from now, what is it going to look like,” Tori Weigant, assistant director of financial aid at West Chester, said in regards to students loans. The dramatic increase in wealth inequality has contributed to student loan debt. The higher education system itself is full of racial and class disparities, from enrolling to college to paying for it after you graduate. One of the biggest effects that wealth inequality has on education is regarding students’ choices and decisions that need to be made when it comes to paying back their student loans. Having a system in place to keep track of the loans is the best way to stay on top of and avoid falling behind on payments, or even worse, debt. Shannon Doyle, a financial counselor with Lutheran Social Service in Minneapolis, said keeping a spreadsheet with your loans is the best way to stay on top of them. She also believes that schools should be more upfront about what students owe. “There should be no barriers to students knowing how much they have borrowed,” she said. 40 million students now have at least one outstanding student loan. Borrowers are typically carrying roughly four student loans each and the average balance of these loans is up to $29,000. This has pushed student loan debt to over $1.2 trillion. To go along with this, about 51 percent of Americans with student loans are either falling behind or not making expected payments. Susan Dynarski, professor of education, public policy and economics at the University of Michigan, is among many who have proposed ideas to help students post-graduation. Her proposed reform deals with income-based repayment requirements. In Dynarski’s proposed plan, she mentions how having income-based repayment systems that include adjustments in bills and the length of the payment schedule can help reduce the pressure that falls on borrowers. 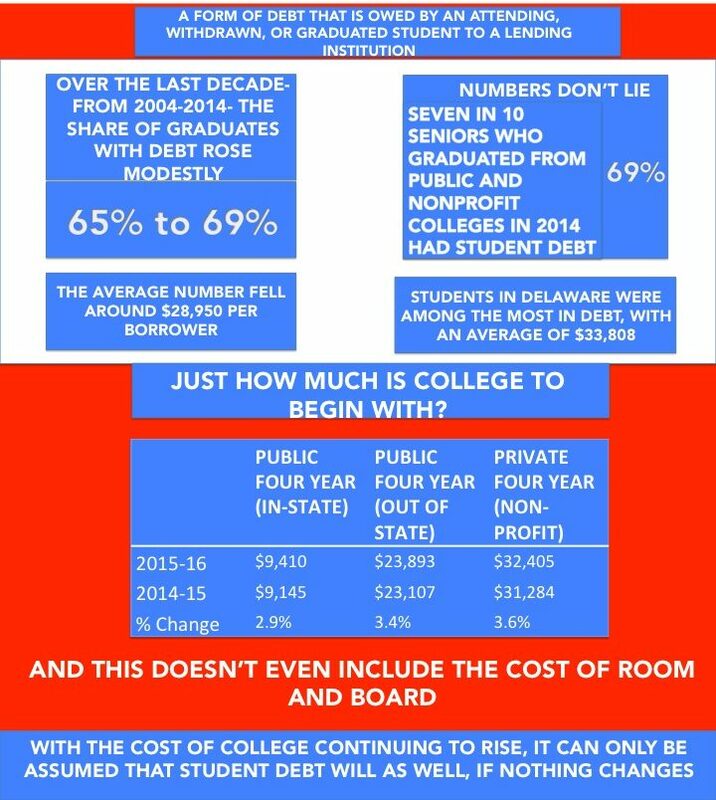 The debt that students come out of college with also greatly affects the choices they can make once they graduate. It can affect decisions such as the type of career they can have, putting off marriage and even starting a family. American Student Assistance was a part of a study that looked at how students were affected by student loan debt. Seventy-three percent of the respondents said that they had put off saving for retirement and other investments. Seventy-five percent said that student loan debt affected their decision or ability to purchase a house. Student loan debt can affect students and their families in many different ways. Students realize that they can’t really begin the life they imagined after graduation until they pay back the loans that got them through school. In the end, it all comes back to wealth inequality because that affects the money that families have and what forces them to take out a student loan in the first place.